To celebrate the new bounty system, I was just preparing for a shopping spree - for example, I need a good YAML parser for a project I'm working on, and thought I'd add a bounty to this question from 2009 to find out whether anything new has come up since then - only to discover that after starting my first bounty, I can't start any more! Users may only have one active question bounty at any given time. This is new, isn't it? It didn't use to be this way. Why is this? Is there a good reason for it? I'm disappointed about this. It imposes an arbitrary and unnecessary limitation and takes away a good bit of my initial enthusiasm for what I thought is now a really great system. Can this please be lifted or at least increased to three or five? Update: @ccomet and @Jon Seigel make some good points about how an unlimited number of bounties would favour high rep users. While I don't fully agree, I can see their point. I still feel at least three simultaneous bounties would be a fair level. Alternatively, apply the limit on bounties for other people's questions only - that would solve the problem of high-rep users setting the agenda, while everybody can continue to put bounties on their own questions as they like. We now allow for up to 3 concurrent bounties per user. We will be analyzing the effect over the next few weeks. This is to limit the number of bounty questions in the system (i.e., to continue giving them special attention). If there are too many bounty questions, they aren't special anymore. Under the new system, every single question in the system is now eligible for a bounty by anyone, instead of only the user's own questions, and every question can have a bounty added repeatedly. This is a HUGE increase in the potential number of bounty questions that could pop up, so they had to be limited somehow. This is also an equalizer of sorts between high- and low-rep users (unknown if this was intended or not). While I agree that high-rep users should have more abilities in the system, limiting the number of bounty questions lets the low-rep user's question get better attention since it won't be dominated by many many more bounty questions set up by high-rep users. High-rep users already have a huge advantage of being able to set up larger bounties without as big a relative penalty (think of a 50k user and a 1k user setting up a question with a +500 bounty on it). The value of the question with a bounty on it isn't really related to the reputations of the users involved anyway. So, I disagree with the proposed feature request as stated. I think it could possibly be increased to 2 questions at once, but it would be a good idea to first give the new system time to stabilize to see how many people actually take advantage of the new ability. I wrote two queries to try to judge the differences between the bounty system before the change and then again after. The bounty system was implementd on 2009-01-27 (According to blog) and updated on 2010-06-18. 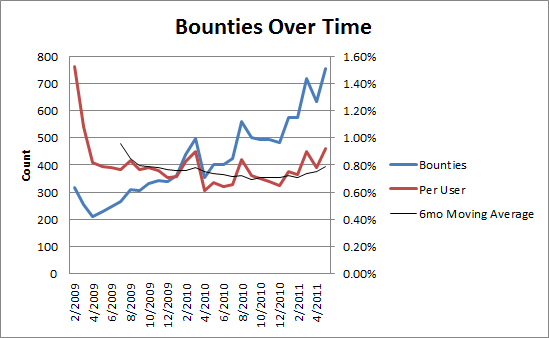 So there have been just about a thousand more bounties in the last year, than the year an a half before that. 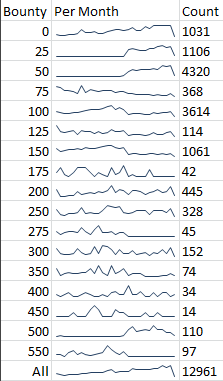 I also measured the number of bounties created per day. The most bounties ever created on a day was 2009-02-03 at 102, with the next highest at 45. There are a greater number of bounties on days after the change, which is to be expected, but could also be explained by the increase in users. I don't know if there's a great deal of difference between managing the number of bounties created or active at any given time. I don't think that there will be a great deal of trouble with allowing the limit on simultaneous bounties to be increased to 2 or 3, if indeed a limit is still desired. My reasoning is: assuming for some reason everyone with a bounty immediately wanted to always run the maximum number, the data says our current worst case scenario would be 135 bounties a day. Which means that despite having more users register, the total ratio of bounties/users dropped after the change and the ratio is lower now than it was when the change was implemented. Alternatively, apply the limit on bounties for other people's questions only - that would solve the problem of high-rep users setting the agenda, while everybody can continue to put bounties on their own questions as they like. Although I fully agree with all of the opinions expressed here—especially Jon's in saying that "if there are too many bounty questions, they aren't special anymore"—for the sake of discussion, here are a few other possibilities. they are each for different bounty amounts. Do questions with bounties actually get more views and attention?